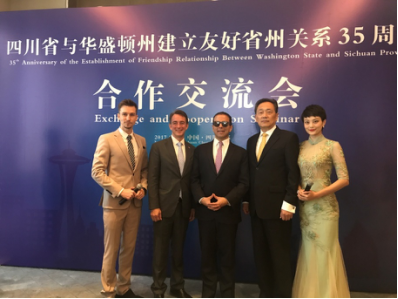 On September 11, 2017, organized by CCPIT Sichuan Council, Foreign Affairs and Overseas Chinese Affairs Office of Sichuan, and Washington State Government, "Cooperation & Exchange Meeting for 35th Anniversary of Sister Province/State Relation between Sichuan and Washington State" was successfully held at Chengdu Wanda Reign Hotel. President Li Gang and Mr. Habib, lieutenant governor of Washington State, gave their speeches respectively at the conference. President Li Gang said at the conference that after Sichuan-Washington State Sister Province/State Relation was set up in 1982, the senior officials have made frequent communications, and stabilized the communication channel through delegation dispatches, holding economic and trade investment seminars, etc., and formed an all-round and multi-level cooperation structure. Based on our previous friendly cooperation, CCPIT Sichuan Council is enthused to work further with Washington State in economic and trade investment, especially in high-end industries like electronic information, automotive manufacturing, and on the expanded cooperation in education, technology, culture, tourism, etc. The two sides also need to further the government communication and the youths exchange to promote the two sides cooperation in varied fields with more substantial achievements. 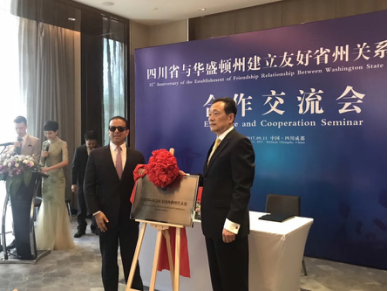 Mr. Habib, lieutenant governor of Washington State, said he is honored to attend Cooperation & Exchange Meeting for 35th Anniversary of Sister Province/State Relation between Sichuan and Washington State. Sichuan and Washington are sister province/states, and share many similarities. Both are rich in resources and suitable to live and work. In the last 35 years, Sichuan and Washington State have carried out various forms of cooperation and achieved fruitful results.There are vast cooperation potentials for automobile manufacturing, information technology industry, agriculture, tourism, etc. in the future. He expects the two sides to have more cultural communication and individual visit to strengthen cooperation in economy, trade, investment, education, culture, technology, new energy, etc. to promote their relationship. In order to strengthen the economic, investment, culture and education cooperation between Sichuan and Washington State, CCPIT Sichuan Council has decided to set up "Sichuan Chamber of International Commerce Seattle Office, US", and the plate-unveiling ceremony was held at the meeting. US-China Youth Exchange Association and Gaoxin District Education Bureau signed memo for setup of sister schools relation. Plate-unveiling ceremony of Sichuan Chamber of International Commerce Seattle Office, US Representatives from 40 enterprises of resources, aviation, automotive, food, etc., American Consul General of Chengdu, Washington State officials, and officials from CCPIT attended the meeting.